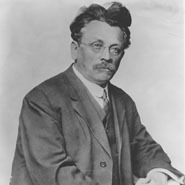 Best known for founding and editing the Yiddish-language Jewish Daily Forward (Forverts)-which, at its high point in the early 1920s had a readership of more than a quarter million-Abraham Cahan was also a prominent Yiddish novelist. Among the newspaper's most beloved features was the "Bintel Brief," an advice column in which readers-predominantly European immigrants-sought advice on dealing with the nuances of life in their new homeland. Cahan was a frequent contributor to various English-language newspapers before his entry into literary fiction. His 1917 novel, The Rise of David Levinsky, is considered a classic American work dealing with the immigrant experience.